One of the most developed pen scanner brands out on the market today is the IRISPen. The IRISPen has many different types of pen scanners for a variety of uses that range from quick and easy use to a more advanced and business oriented use. It is important to understand the different types of IRISPen scanners so you can maximize the efficiency of the product. The following is a breakdown of the different types of pen scanners that IRISPen provides. This first type of pen scanner is the most all-around performing pen scanner that IRISPen puts out there. As we mentioned earlier, this pen scanner works like a highlighter and is able to read text and numbers and can still reach a 100% accuracy level. The IRISPen Express also comes with a "smart wizard" that provides a series of templates that guide the user through the process. From scanning images to the ability to connect with multiple office programs, the IRISPen Express has every basic feature one will need in a pen scanner. If you are looking for a pen scanner that is more specific and advanced in one particular area, then the IRISPen Translator may be the one for you. 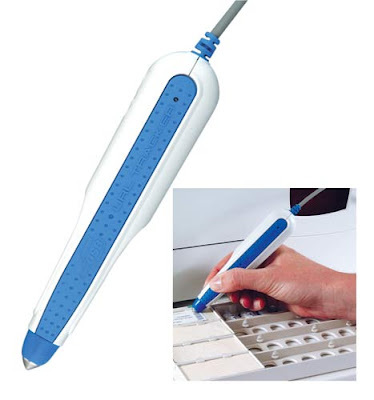 This type of pen scanner is used for just what it says, translating. The IRISPen Translator has the ability to scan text in one of 11 different language pairs to get instant conversions. One other feature that the Translator pen scanner provides is a "voice synthesis" program that will read the text back to you after you have scanned it in. This feature will help you verify or learn the spoken language that you just scanned. Just like the IRISPen Express, the Translator is able to recognize 128 languages, an astonishing amount. If you are looking for a business pen scanner that is more advanced and has new features that will help productivity, then the IRISPEN Executive is the pen scanner you will want. One feature that is exclusive to the Executive is the "image adjustment". Say you scan a low quality document where it is hard to see the text or image, well the pen scanner now has the ability to enhance and optimize the quality of that image. Another feature you will find in the Executive pen scanner is the multiple line scanning feature. Just like it says, you are now able to scan multiple lines at a time so you can now scan larger documents such as articles from a book or magazine. This recently developed version of the IRISPen can now recognize cards from over 54 countries such as China, Japan and Korea. Another feature of the Executive pen scanner is the ability to read barcodes. This feature would be extremely helpful for any kind of business use. Along with the barcode feature, any kind of Executive pen scanner has the ability to read hand printed number or letters. Again, this expands the range of possibilities that you can scan with your pen scanner. These specific types of pen scanners show the range and variety of features that IRISPen has come out with over the years. For whatever reason you are using your pen scanner for, IRISPen has made one that will suit that need. Be sure to check out all of our pen scanner advice and information at Pen Scanner Information.